When I open my contacts list the phone ringer is silenced. Why is this? I see the "Vibrate Mode Only" symbol on the screen. However, if I hit Home instead to exit contact mode, the phone remains silenced until I change the volume setting manually. How bizarre is that? Does this happen on your phone? Might there be a reason for this? I'm not familiar with the phone but it does sound abnormal. I guess when you leave via the home button you're not closing the app. Try, if you haven't already, a Cached Data clear. A soft reset is also good. If no go, try wiping the Cache Partition in Recovery Mode. Running Nova in my Moto G and nothing like this ever happened. Weird. I want to start exploring this. I guess I can presume that there is no reason to silence the phone when I go into my contacts list. I just don't want to spend a lot of time on the problem just to end up hearing "Oh yes, it does this because..."
At least I now enough to watch for the silencing and that an easy temp fix is to hit the volume button a few times. I guess I will have to know more about what "Cached Data Clear" and what the "Cache partition is in recovery mode". Give me time, I will explore it. Time to take you up on that one.... I looked around for information about "Cache Partition" but no go, cannot make enough sense out of that one. What might the collateral effect be if I clear cache data? It presently reports having 48.18MB. Here's how to do the Cache Partition wipe on the Moto G....be careful not to accidentally do a Factory Reset which will wipe the whole phone. Clearing the Cached Data as far as I know has no ill effects and I do mine with no qualms frequently...say once a week. Cache Partition wipes, perhaps once a month. The latter can take a long time, 5 min or more, on my Nexus 5, so be warned as it may be similar on the Moto G.
Sheez. I bought a Moto G yesterday as a backup. That's way more complicated than Samsung's. OK, so, I went through it but noted no difference. The cache data is still 48MB. Should that be any different? I just checked the loss of ring volume, and the phone still silences when I click on my contacts list. This is when using the Nova launcher and I don't think I have ever seen it using the Moto G default launcher. Maybe I might do it again least the clear didn't work. It is not much of a hassle now that I am aware of it but wonder about it as a "feature". I thought you'd already cleared the data cache. Settings, Storage, Cached Data. I just cleared mine and it dropped from the forties to just over 1mb. Having said all the above I'm not very confident it will fix your problem but just worth trying. It went down to 2M and yes, it did not change the issue with the contact list. Now that I see its pattern and easy work-around it is a bit more tolerable. It is an interesting trait though. I'm sorry it hasn't fixed your problem but those remedies may come in useful on future occasions. It may be worth reposting in Motorola forums where other owners may be able to suggest something. Just a thought. Have you tried the same action using the stock launcher? Same problem? No, it does not happen when I use the original contact list (People). It usually (not always) happens when I use the Nova Contacts icon (Ev-Contacts). I will check the Motorola forum. Excuse my ignorance. Are we talking about the Nova launcher? What's this Ev-contacts? It may well be my ignorance... The Nova Launcher is the only thing that I have allowed into my phone (to my knowledge). 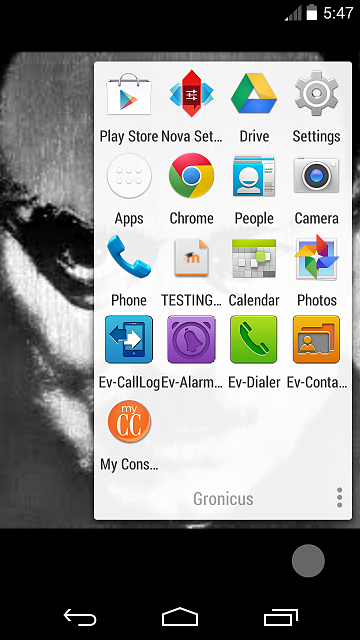 When I did, I immediately saw at least four new icons when I did: Ev-CallLog, Ev-Alarm, Ev-Dialer, and Ev-Contacts. I never questioned the "Ev" part of the icon name. Is it not part of Nova? If I knew how to take a screen shot, I could show the icons on the screen. Hummm. Never heard of Nova doing that sort of things. I've got the free version anyway, but I can't find anything about this EV thing. Check something. Maybe you're using an app called easy viewer. Even if it magically appeared, I still like it. Vol Down and Power, shuts down either the volume or power or both. If I did get a screen shot, would it show up in Picture folder? DING!! You get a cigar.... and get your choice of a kewpie doll. All good then! Glad it helped. Keep enjoying your fantastic phone. Minimal cover or case for S5 with wireless charging back? lg g2 stuck in twrp help!! !